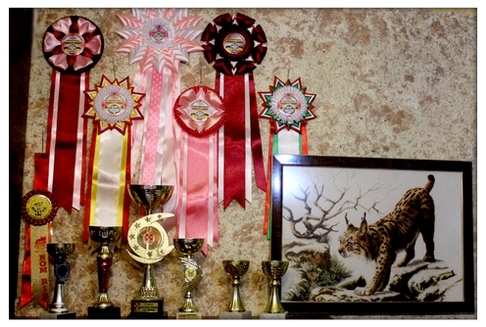 Cattery persian and exotic cats Steam Cloud rad to welcome you to their website. My name is Irene and we live in the first capital of Ukraine in Kharkiv .My cattery has existed for over 10 years.Its activity aims on obtaining healthy and strong of offspring is different in the type and various colors. Basic line of breeding is based on a okrassah color-Point The breeding of the used line of such famous kennels as:Mountcascade, Prancenpaws, Careyata, Brigantina, Catley,Oakheaven,Purringwood,Shanlar, Demiara,Benua,Light Air, Marhei,Puffstuff,Demanch.Animals from my kennel have titles, and they repeated the participants of the exhibitions and Best in show. In my kennel small number of the animals and all of them are beloved members of our family! I hope that you liked my Pets. The kitten from kennel Steam Cloud,will bring to your home comfort, tenderness and warmth, but also become and well as a favorite family member .We will help you to choose a kitten to your tastes.